Chocolate fondant. The dessert worth waiting for, and practically the only menu option that warrants its very own time slot. As far more complicated and time consuming dishes sail forth from a restaurant kitchen, this simple little pudding sits smugly alongside instructions to ‘please allow 15 minutes’, tempting us with its decadence yet teasing us with the time delay. Proof, it would seem, that good things come to those who wait. In actual fact this simple little dessert can be made very easily by the home cook. Timing, as suggested above, is key, but once you’ve mastered that it couldn’t be easier to whip up a batch of these delicate, decadent desserts, their centre soft and sunken, encased in a wall of mousse-like cake and oozing thick hot puddles of chocolate lava. With much of the theatre of a soufflé, but without the associated performance anxiety of rising to the occasion, the fondant has become a firm favourite with dinner party hosts and Valentine’s Day diners around the world, hoping to impress their guests with a tried and tested formula of seductive chocolate success. These perfect little puddings are so entrenched in our consciousness it would seem they’ve been around forever. In fact, this classic of French cuisine was only discovered thirty years ago, when triple Michelin starred chef Michel Bras created a dessert with a frozen chocolate ganache centre. 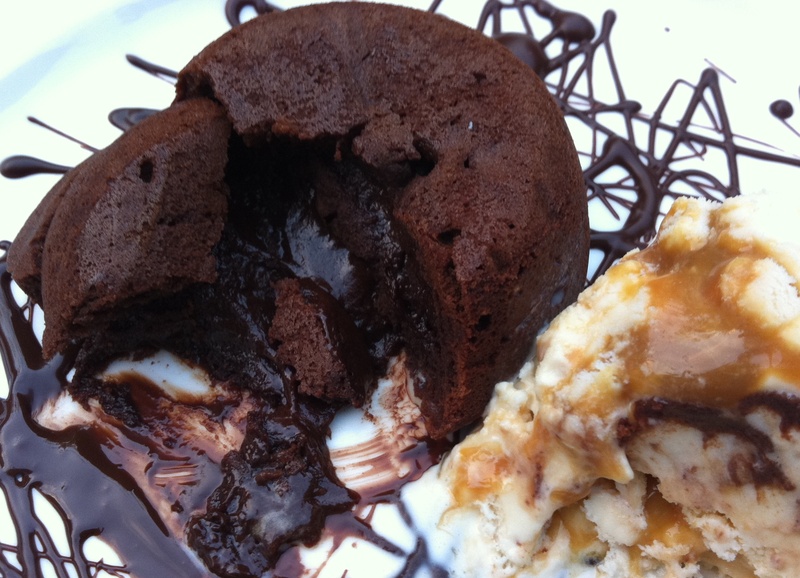 His application for a patent on this molten-middled cake never came through – as evident from the dish’s appearance on menus the world over. Bad news for Bras, but brilliant for the millions of chocolate lovers everywhere who might otherwise never have tasted the beauty of this simple little cake. Discovering the history of the chocolate fondant took me on a little trip down memory lane. Cast your mind back fifteen years or so to a warm summer’s day in Southern France. A much littler loaf, on the cusp of her teenage years and about as fussy and obstinate as this transitional age might suggest, is sitting at a dining table in Michel Bras’ restaurant of the same name. While her parents and older brother explore a menu of multiple courses, cooing in delight over unidentified jus of this and sous-vide of that, this fussy little loaf lover is presented with just two simple dishes to satisfy her suspicious – and (oh the horror) vegetarian – persuasions; a salad comprising over fifty different herbs, vegetables and flowers, and the most beautiful, elegant mushroom tart you may ever have seen, laid out on a slab of granite and sprinkled with edible flowers. I’m not particularly proud of this moment. Fussiness with food was something of a theme in my younger years, and looking back now as a fully blown food fanatic, I can hardly believe I refused to even try so many incredible dishes. This is three Michelin stars we’re talking about. Three. But you live and learn from your mistakes, and it could be argued that a journey of culinary discovery is perhaps more rewarding than the life of someone who has simply always enjoyed every single thing placed in front of them. You could even argue that my younger self displayed a somewhat acute understanding of this maestro’s menu, picking – as I did – his signature dish, the gargouillou. Perhaps I’m talking rubbish. But there’s also the possibility that, without really knowing it, this was the beginning of a longer lasting affair with food. Nowadays I’d love the opportunity to return to that restaurant, to sample the menu in full and appreciate Bras’ cooking in all its extraordinary glory. But until that time comes, I’ll make do with recreating a dish that celebrates his genius at its most basic, something that would have appealed to my younger fussier self, but still hits all the right buttons in a more grown up, chocolate loving me. 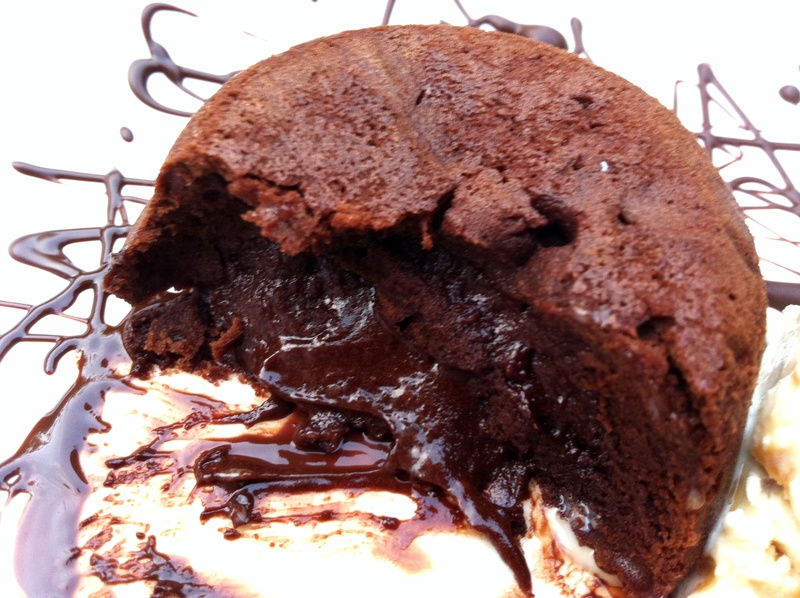 So here it is, the chocolate fondant or moelleux au chocolat. Velvety, smooth and utterly luxurious. Enjoy. Place a baking sheet in the oven and preheat to 200 degrees C. Butter 4 x 160ml pudding moulds and line the bases with discs of baking paper. If you don’t have pudding moulds, ramekins will do. Melt the chocolate pieces over a bain marie, then set aside to cool slightly. Cream the butter and sugar together until pale and slightly fluffy. Beat in the eggs one at a time then add the vanilla and a pinch of salt. Stir in the flour until just combined, then gently mix in the melted chocolate. The mixture should thicken at this stage. Divide between your prepared moulds and bake on the preheated baking sheet for 8 – 10 minutes. Turn out straight away and eat with a big dollop of ice cream – I served mine with homemade caramel praline ice cream (pictured). The uncooked batter also keeps well in the fridge making these perfect dinner party desserts. If cooking from cold allow an extra 2 minutes i.e. increase cooking time to 10 – 12 minutes. Once you’ve made them a couple of times you’ll know exactly how you like them, and can adjust timing accordingly for a slightly more molten or firmer pudding. Once you’ve mastered a basic chocolate fondant the world is your oyster in terms of flavours combinations. Freeze 4 teaspoons of dulce de leche mixed with a little sea salt then pop into the centre of the uncooked batter for a salted caramel version, add crushed hazelnuts or peanuts for caramel nut, throw in raspberries, cherries or blackberries for a fruity twist or add 25ml cooled espresso, orange juice or liqueur of your choice. If adding the extra liquid, you’ll need to use an extra 25g flour to balance this out. I’ve also got my eye on a peanut butter version…if it’s a success I’ll pop it on the blog in due course. Watch this space. I’ve seen so many failed chocolate fondants on Masterchef that I’ve never dared to try my own, thinking that they were some incredibly complicated pudding but yours look absolutely spot on! They are one of my absolute favourite puddings though so I’m really excited to give them a try! I’m definitely thinking about fondant pud for Christmas as I hate Christmas pudding! There’s something very special about breaking into the pudding and releasing the molten contents, much like a poached egg! Don’t worry I was massively fussy too and now I eat quite a lot of things that I actually had never tasted but they sure looked disgusting so never tried them! i’m hungry and i made the mistake of looking at you photos, littleloaf! always a sucker for chocolate your molten cakes really intrigue me! interesting, I have a recipe that uses extra egg yolks, this seems simpler will give a try! I fell in love with molten chocolate cakes the first time I tried one. I was thrilled to discover they’re not that difficult to make. Your recipe and beautiful photos are tempting me to make some for the holidays! Oh you read my mind! I was just thinking about making these yesterday and found a recipe I want to try. Now i just want to eat yours off the screen! I always order it if its on the menu even if it means waiting 15-20 minutes. Well worth it. I have been looking and wanting to make this for a long time. My favorite dessert at “Roys” restaurant. This looks so yum! Jennifer – it was pretty hard taking the photos, I just wanted to eat the whole thing! Working London Mummy – I guess that would make it richer, but perhaps not quite so light? Lisa – we have fondant icing too, but this kind of fondant is infinitely better! 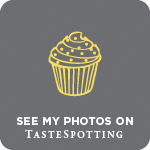 Baking Addict – well worth the extra wait, although so disappointing when restaurants get them wrong. First of all, loaf, this looks incredible. But it’s also very impressive – it can be a little tricky to get these perfect, which you have done. Just. YUM! Going to have to make these soon I think! Either the fondant or the ice cream would be a great dessert on their own – but together. The fondant looks…perfect. It’s what I’d hope for if I ordered it! Time is key indeed. I have never made one myself… But we all know, its almost that safely assured delicious dessert on the menu..! moelleux au chocolat… Just delicately beautiful. Chocolate fondant pudding is definitely one of my top 5 favourite puddings. The oozing centre with some creme fraiche is a heavenly combination. 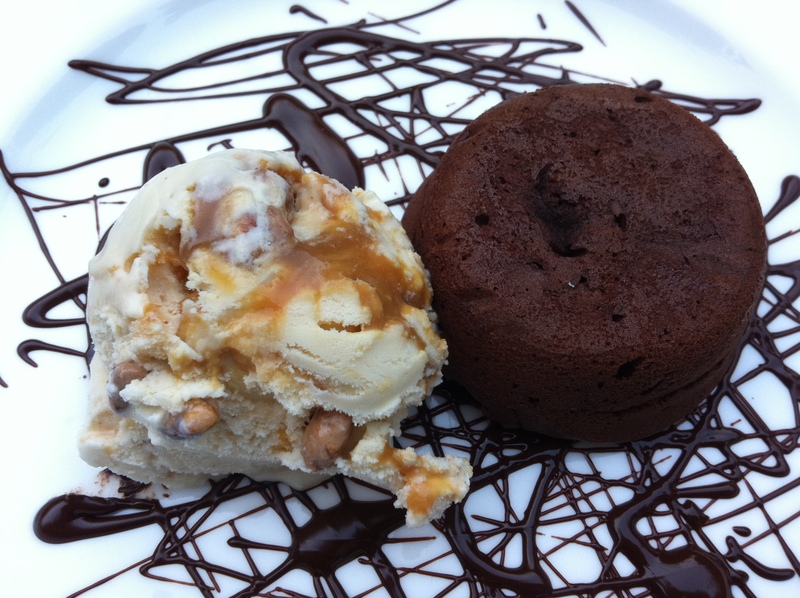 Yours have turned out beautifully and the praline caramel ice cream looks to die for. Thanks for a great recipe, this pudding is a total classic and I find it hard not to order it when I see it on a menu.. . I’ve been kitchen-less over the last 3 weeks and cant wait to get cooking again. These most definitely have the wow factor, so decadent. I think you can turn your hand to anything!! Frugal Feeding – thank you. I originally put it down to beginner’s luck, but have made these a couple of times since posting and they’ve worked every time. It’s a good, solid recipe. Lorraine – try this recipe, I promise it works! The Caked Crusader – thank you. No need to wait to be served this in a restaurant now! Mandy – a little bit of caramel or praline really lifts these – we had them with caramel sauce instead of the praline ice cream the other day and they were gorgeous. Ruthie – your poor thing, I hate my kitchen being out of action for even a day so feel your pain! Yum! How interesting that they are called fondant puddings in the UK…I was so confused at first! Mmmmm chocolate fondant would have to be one of my all time favourite desserts!!! The best one I ever had was at Daniel in New York, and it had a salted caramel filling. Oh my god it was amazing!!! Your pudding looks SO good. I love how the filling is oozing onto the plate, the way it should be. Erin – sorry for any confusion, this definitely isn’t fondant is in icing! Kristen – hehe, knowing the recipe can be a slightly dangerous thing! I have always wanted to make a molten cake but was afraid. How can I look at the scrumptious photos and not make these? 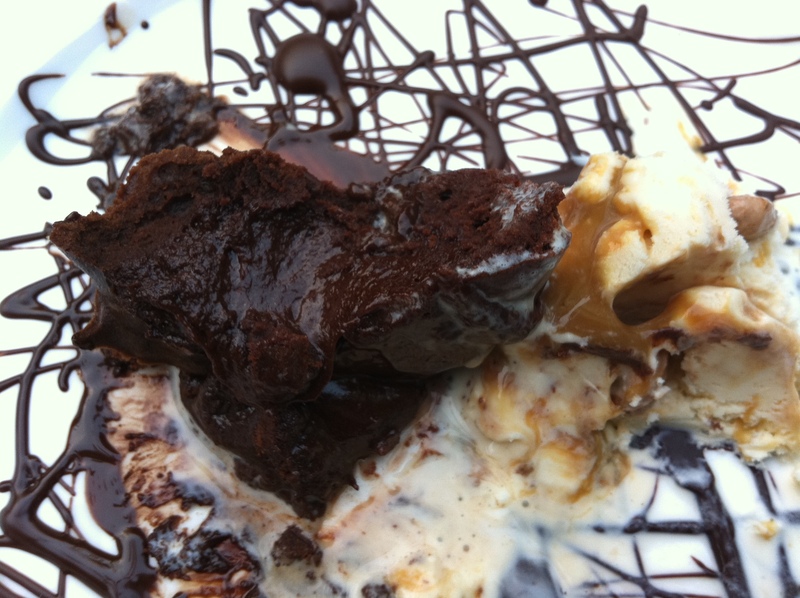 Oh who doesn’t love chocolate fondant – not me anyway. Looks like you’ve got yours off to perfection and fantastic photographs. The ice-cream looks amazing too. Am impressed your parents found a restaurant in France that served good vegetarian food.